From the Setup menu select Handicap Calculation Parameters and you will see a form that includes the below information fields. The table above follows the exact USGA formula - 96% of the best 10 out of 20 scores. Please note that 20 scores are required to produce a full USGA handicap and at least 5 scores are required before an initial handicap is calculated. Most leagues do not use USGA handicapping because it takes too long to develop a handicap, plus handicaps change very slowly. You can deviate slightly from the USGA and relax the minimum number of scores required from 5 to 1. 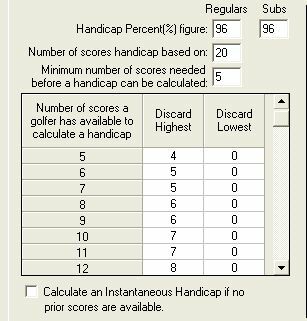 This allows you to calculate the initial handicap with only one score. Remember—only the best score out the first 5 or 6 will be used for handicapping. The results will be that handicaps will move only down at first and then handicaps will slowly stabilize. If your players don’t have at least 10 practice\previous scores I would not recommend emulating the USGA handicap system.